Home » Forums » Game Creation » New game ideas » What's the deal with getting published??? What's the deal with getting published??? direction I should be taking now? Its fully ready to print and sell but I don't know whether to go through self-publishing places like Kickstarter or find an investor? I'm not sure if I can post information regarding my game on this website so I'll keep it short and sweet. and try to find 4 special cards in the deck that will win them the game. also cards like future to check whats coming next. It's an awesome game that is loved by everyone I have ever played it with and can be played over and over again. The whole idea around the game is actually to raise awareness for a large problem we have in the world. The game hides the informative information behind the cartoons and jokes but still incourages players to learn a little bit about the world. It's a new way of combining self awareness and enjoyment without pushing people away with to much information. in what to do next? I recommend not describing your game as a cross between Cards Against Humanity and Exploding Kittens on game designer forums. The immediate reaction you're most likely to get is " Oh no" or " No thanks". Oh no, because at least once a week a designer is trying to sell their version of Cards Against Humanity ( twice a week for Monopoly). No thanks, because alot of hobby gamers don't really consider Cards Against Humanity a game, and they feel almost the same about Exploding Kittens. And I say this as a person who enjoys playing both. -You've played with 100 strangers or more. -You've had blind playtesting, where people read your rules and figure out how to play your game without you helping. If your game has gone through all the playtesting it needs, then I recommend self publishing. I think it would be difficult for you to find a publisher for your game, as it is aimed at a niche market. At the same time, I think it's cool that you have truthful factoids about the Earth on your cards. Maybe look for a non-profit who may want to partner with you to get your idea out there. I think they would be perfect for locating your market and giving you visibility. Your game needs to be in its finished state before you approach them though. Lastly, don't be afraid to share the details of your game. People don't go around stealing game ideas, especially from new designers. It's alot more difficult than you think to successfully take someone's idea and make it into an amazing game. It's like the number of people who visit this site wanting to make the NEXT big TCG or CCG... Not knowing of the implications because it's the only Board Game or Card Game related experiences they've ever had. Suffice to say, YES some exceptionally benign games make it... Against the odds. But you'll find a TON more games that are innovative in other ways that either get picked-up by a Publisher or are Self-Published via a Kickstarter. Suffice to say @Fertessa explains it best on how "most" designers would react. hello. it is hard to judge from 1 card and a brief description what to do with the game and it is true that its extremely unlikely someone will steal your game... but if its too much like cards against humanity i just wouldn't bother (there are already too many of them)the fact you say its also like exploding kittens (a great silly game) gives me some hope, as i dont know what a cross between those games would look like. finally instead of describing a game as like... or a cross between... use game mechanics and theme. "its a steampunk push your luck dice game" not "its like zombie dice"
Yeah I almost stopped reading at CAH and EK. Those are totally different games except that they were super-strong Kickstarters. Kickstarter is probably your best bet. Google Jamey Stegmaier and read 100-200 articles there. That said.. edutainment might not be an easy sell. That one card you shared is heavy-handed and literally tells us nothing about the game. Yeah, that's a terrible pitch, sorry. If I were a publisher I'd literally delete the email at that point. I'm willing to bet it's not, but maybe it's close. How much play-testing have you done, and with whom? We just had a thread from someone who had a four-years-in-the-making board game design that was completely done, except we eventually convinced him that it needed a big tweak. Oh, and is all your artwork in CMYK? You can. People post entire PNP sets here to get feedback.. not saying you need to do that, but you can put just about anything here. More than a card that does nothing would probably be useful if you want feedback. It's a party game with a ton of colours, cartoon pictures and hilarious quotes. Quotes aren't hilarious. Maaaaybe the first time they're seen, but after that, no. Guessing that's the Exploding Kittens part. I'd be surprised if you could find a publisher, but that's not really my area anyway so who knows. A Kickstarter seems obvious. If you don't have a Facebook/Instagram/Twitter/etc page, make one RIGHT NOW. Okay, now that you've done that, post there at least once a day, and look for ways to build your followers. I'd recommend at least 1000 followers in some way before Kickstarting anything. Though you can start making your page now.. it'll take longer than you think. There are a lot of bad ones and you don't want to be one of those. You need to figure out what your game costs to make. If it's just cards, check out printninja.com. They're a pretty good option for card games imho. Then go read Jamey Stegmaier, like I said above. Anyway, I had a reasonably targeted 600-person email list and, hmm, 100 Facebook followers I think, and I sold like 35 copies day one from that email list (like 60 total from the list, by the end). It's tough to acquire customers when you're new. It might not work. You'll DEFINITELY need to share a good chunk of your game to get people interested.. none of this single card stuff. Thanks very much for your in depth response, I shall work my way down the list and tick each area that you have said off one by one. I wasn't really sure initially how to describe the game so hence why i compared it to those two card games. Its nothing like them but now that I know what genre to use I can completely irradicate the comparison sentences. I was just scared people would steal my idea or something, hence not explaining it in full detail. Should I go through a big company for publishing or a smaller one. I'm not interested in creating a business as that takes a lot of time, money and experience but i am interested in designing and have a few other already created games in my arsenal. hello. im afraid i cant help with which publishers to approach, as i have never done it myself. look at companies that make your kind of game and approach them. as a new designer i urge you to check out some of the podcasts out there. board game design lab is a good one. i was also a bit wary of setting out my game for similar reasons, but the game design community is very open (unusually for a creative industry). also by putting your design out there you are giving yourself extra protection as you can show you had the idea first. Funny it seems like most "designers" come interested in those two card genres ... And yet I've seen several Roll & Move games... But ... No copies of Catan?!?! Like Settlers of Catan has probably been played by most people who have limited exposure to modern day Board Games. It's like a solid staple and yet... No one seems to be wanting to "re-design" Catan. I would argue that most non-gamers have not played Catan. They probably have only played Catan because they know a hobby gamer, not because they bought it on a whim. And probably, to beginning designers, Catan isn't a puzzle they can figure out yet. They are familiar with Monopoly, and can copy its mechanics without even knowing what mechanics are. Catan requires a bit more work and understanding of games to copy. My guess is that "Settlers of Catan" is probably the MOST played game in modern day Board Games. I know Pandemic is also very popular... But for some reason I get the impression that Catan has been around longer and that's why I account for it's larger play-base. But I could be wrong. From a BGG search I find that although Catan is in position 294, they have the most amount of VOTES at about 81,000 votes... Closest competitor is around 78,000 votes (and that is Pandemic in position #75). So I would confirm that "Settlers of Catan" is probably the most played modern day Board Game... Just by the numbers themselves. Note #2: Funny thing is that Dominion is next in #74 with about 65,000 votes. Something must be really off that people chose to "down" vote "Settlers of Catan"... I wonder why??? 7 Wonders is also close with about 64,500 votes! Another popular HIT too! Alex, I want to make a couple of points here. 1) Intellectual Property can and will protect your design. By posting here you are creating Intellectual Property. If you post your rules book then you have officially protected your game and all that it encompasses. That should help you feel comfortable in sharing your ideas in a public forum. 2) Incorporating as a Game Design company not only protects solidifies the Intellectual Property which that company (you) produce.... but it allows you write off all the associated expenses of Game Design. Including Art, Design, Research and Development, and so on!! Assuming you are a Citizen of the USA. I'm sure many other developed nations have similar laws. A side note, the people who routinely post here, are worth more than Gold to your game. Gold costs money, but their advice is free!!!!!!!!!!!!! With all that motivation for your game maybe you can talk one of the Self Published designers here into partnering with you to print, kick start, and publish your game to add value and a new market to their already growing Publishing Companies!! I think that is a natural progression to the knowledge and partnership I see here on this Forum. BGDF Unite! Did you not get my invoice? I can re-send it. The BGG ratings are about how much BGG users like a game, and nothing to do with how well they sell in general (although there is some clever mathematical stuff meaning that games with fewer votes rank lower than ones with more ratings but the same average). BGG users (and voters) are a very small minority of people who play board games. Catan is a great game, and certainly very widely owned, played, and loved. It may have been usurped by Ticket to Ride, but it's still a very big deal after nearly a quarter of a century now (more than twice as long as Pandemic has been around). Dominion, Pandemic, and 7 Wonders are certainly more popular among "hobby gamers" than Catan, largely because of their depth of play, so it's not surprising that they rate higher on BGG. Is in position #132 and only has 57,000 votes. I understand that the BGG votes are not 100% accurate in terms of "Global Play" ... But I would dare to guess that they are "representative" in terms of ratios of the given populace that have played the game globally. So if one is 81,000 then I would suggest something like 8,100,000 people have played the game globally. And if another is 78,000 then I would guess something like 7,800,000 people have played. Even these figures are just approximations, because in some instances I believe the player count to be even HIGHER. Anyhow you get what I mean... Cheers! To continue on this side-topic (apologies to the OP), the BGG rankings are basically based on the average of the user ratings (from 1 to 10), with a weighting so that games with fewer ratings are pulled towards the middle of the scale. It's a bit weird, but it is what it is. Again, this is votes from relatively dedicated hobby gamers. If you made a list by worldwide sales (or plays), it would be Monopoly, Scrabble, Clue, and things like that. ...Again, this is votes from relatively dedicated hobby gamers. If you made a list by worldwide sales (or plays), it would be Monopoly, Scrabble, Clue, and things like that. Monopoly is ranked #16230 with about 22,000 votes. Scrabble is ranked #1567 with about 22,000 votes too. Anyways all that to say, is they also are ranked too... But IF you talk about "Global Sales" or "Global Plays", I'm positive those all have higher ranks too!!! If you're satisfied with the GAME, you should work on your RULEBOOK. Do you even have a rulebook yet??? If you do, I would post a copy of your rulebook here on BGDF and let the other designers have a look. They will review the format, style, content, grammar, punctuation, etc. The whole nine yards! And of course given the rulebook, we'll see who can figure out HOW your game is actually played. This will go a long way in solidifying your rulebook and the "attractiveness" of your game. To be real honest, I try not to critique games in-so-far that they each have their own distinct elements which peak a player's interest. BLIND playtesting is when you SEND a prototype and your rulebook to a team of gamers to playtest without your assistance. Their goal is to see IF they can read the rules and then play the game. Another GREAT service for refining rulebooks is The Game Crafter's "Sanity Tests". It costs $30 USD and the reviewer will help guide you in improving the layout, content and format of your rules. It may take several tries to score high enough in order to be satisfied with the rulebook. You can also work on a "Sell Sheet" which is a sort of "advertisement" for your game... Basically this sheet of paper (1 side) should explain the game, the hook (what attracts people to play) and components. This will give any publisher an idea about the game itself without requiring too much input from the designer. 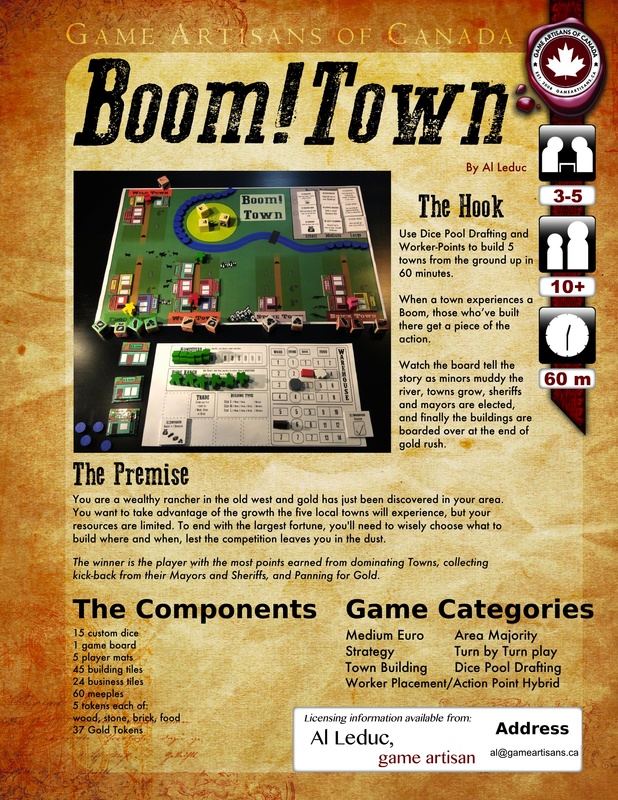 Note: I just wanted to add, I am not part of Game Artisan's or have any direct link with BoomTown. I just thought that the "Sell Sheet" was well executed and presents what most Publishers are looking for. Thanks for posting the sell-sheet. Very interesting to see what they look like. And since you mentioned our ability to proof read...I hope Game Artisans spotted that it's Miners who are muddying the river, not "minors"! Unless the kids are being naughty there!